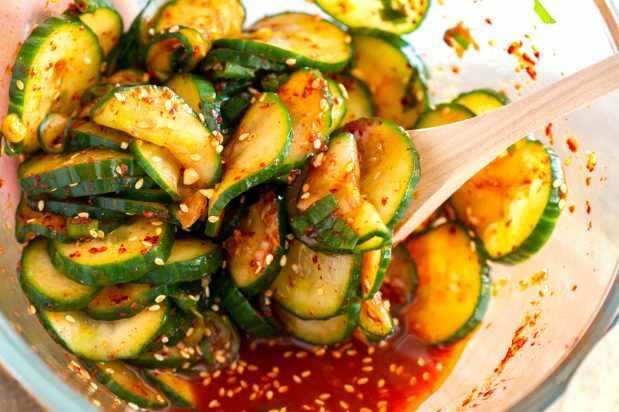 Put the cucumber and salt in a bowl and mix. Leave it for 15-20 mins. Mix the gochugaru, garlic, vinegar, sugar, sesame seeds and sesame oil in a bowl together to make the seasoning sauce. Rinse the cucumber with cold water to get rid of the slat. Dry the cucumber delicately. Mix the cucumber with the seasoning sauce and spring onion. Serve as is or leave in the refrigerator to chill for 30 mins.